Why Savings and Internal Lending Communities (SILC)? Most formal financial institutions are unable to reach the world’s poorest people, who greatly need access to financial services. To address this need, we help community members to form groups, pool their savings and make loans to each other. This approach has created economic opportunities for nearly 1.8 million people who live in the world’s most impoverished areas. CRS provides training and capacity strengthening to new savings groups, using a highly sustainable market-based approach. Upon completing their first 12-month cycle, groups can operate on their own. Each savings group agrees to a set of rules to guide its activities. Groups meet on a regular basis and members contribute a fixed minimum sum. Members take out loans, which they pay back with interest. Loans help support farming, grow businesses, and pay for schooling. Group members get back their investment plus a profit, which they can reinvest in the group. Two CRS employees — Marc Bavois and Dina Brick — won Practitioner of the Year awards from the SEEP Network recently at the annual SEEP conference. These awards are given to practitioners from SEEP Member organizations who embody using collaboration and learning to scale impact. CRS’ SILC methodology is a holistic, savings-led microfinance approach that provides a safe place for poor households to save and borrow to increase their income. The goal is to help these households better manage their existing resources by teaching them basic financial management skills. 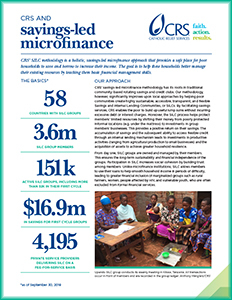 This two-page handout, "CRS and Savings-Led Microfinance," provides an overview of the approach, strategy, and successes of the CRS SILC program. We’ve developed a new way to help savings groups support themselves. First, we offer advanced financial training to certain community members, who become certified Private Service Providers.Then these PSPs help savings groups make smart financial decisions. In return, savings groups pay the PSPs a reasonable fee for their services. This market-based approach is highly sustainable, and it's gaining momentum around the world.